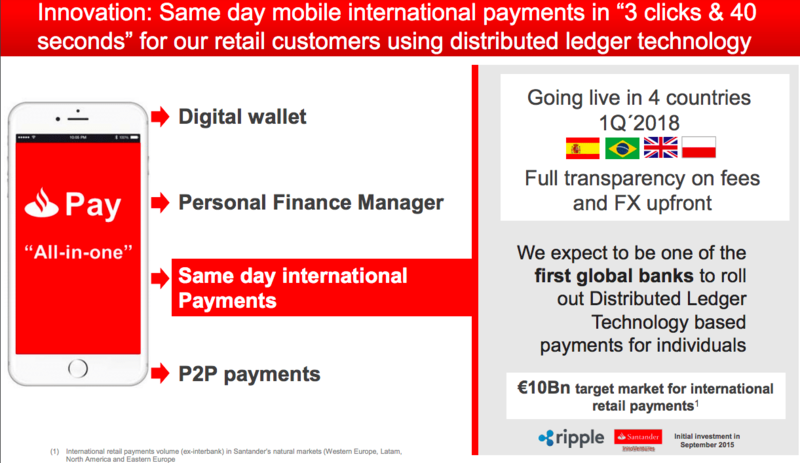 European banking powerhouse Santander is partnering with Ripple to create a new platform that will allow users to facilitate cross-border transactions seamlessly. Back in the beginning of the year, when the firm’s CEO Ana Botin presented the 2017 earnings the app was highlighted out while mentioning that it will be available to Brazil, Poland, Spain and the UK. Santander first invested in Ripple back in 2015 through its venture investment arm Santander Innoventures, shortly after concluding that it was only a matter of time before distributed ledger technology would be adopted by banks. Since then, Santander had been running test trials [similar to more than 100 financial institutions around the globe that started working with Ripple] with an app for international payments which turned out to complete transfers in less than 24-hours. California-based Ripple sells a blockchain-based payment network designed for use by institutions. For some time now, news and developments that are related to Ripple [XRP] are taking place on a daily basis. XRP transaction speed of processing has surpassed Visa transaction speed at a stunning double the rate – processing 50,000 transactions/sec while VISA reaches to 24,000 transactions/sec. One of Ripple’s products is called xCurrent. It “enables banks to instantly settle cross-border payments with end-to-end tracking”. Another is xRapid, a system which uses the Ripple cryptocurrency (XRP) to make payments work. Ripple has been called “Western Union using blockchain technology”, and even the real Western Union has experimented with Ripple products. Ripple was first installed by a bank in 2014, and since then it has expanded aggressively, signing with hundreds of financial institutions worldwide. Santander is not the only big name on its list. To date, companies like Moneygram, BBVA, Cuallix, and Western Union have all tested out Ripple’s technological offerings in an attempt to evolve their existing payment systems. While these tests may have been successful to varying degrees, the fact that blockchain services are being pursued by large financial players is in itself a step in the right direction.